Home / News, Politics / Deputy Chief Justice PHILOMENA MWILU arrested over corruption – Also targeted are Central Bank of Kenya officials! Deputy Chief Justice PHILOMENA MWILU arrested over corruption – Also targeted are Central Bank of Kenya officials! Tuesday August 28, 2018 - Detectives from the Directorate of Criminal Investigations (DCI) have today raided the Supreme Court building in Nairobi and arrested Deputy Chief Justice Philomena Mwilu over corruption related case. 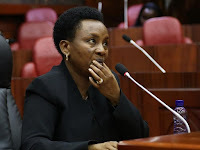 According to Kenya Revenue Authority (KRA), Mwilu has been suspiciously moving large sums of money in and out of banks. The arrest of such a high-ranking judicial staff member, unprecedented in Kenya’s history, is the culmination of weeks of investigations into brazen corruption at the Judiciary, and is likely to send shock waves throughout the institution. DCI boss, George Kinoti and the Director of Public Prosecutions met Judicial Service Commission (JSC) members before arresting the DCJ. She has been taken to custody at CID headquarters waiting for processing of her case tomorrow. Mwilu is also said to be linked to the collapse of Imperial Bank where she received a bribe of Sh 12 million. Kinoti said they are also targeting Central Bank of Kenya officials because they were involved in the looting of Imperial Bank.